About one year in the wild; up to 8 years in captivity. This is a small North American deer mouse. Adults are 5½″to 6⅝″ long, including the tail, and weigh from 0.68 to 0.87 ounces at maturity. The body is round and slender. The coat (pelage) on adults is short and soft. It is grayish-brown on the back and sides and white below. On young individuals the pelage is gray. The head is pointed. The eyes are beady and black. The ears are large. The whiskers are long and prominent. The tail is relatively short, 23 ⁄16″ to 2¾″ long, about 40% of the total length. It is sharply bicolored, dark above and white below. The hind feet are ⅝″ to ¾″ long. The hind track of a deer mouse is ¼″ to ½″ long, ⅜″ to ½″ wide, and shows five toes. The fore track is similar in size but shows only four toes. The trail is 1⅜″ to 1¾″ wide, similar to that of a squirrel only smaller. 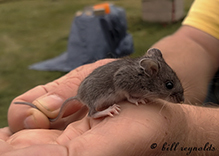 White-footed mouse (Peromyscus leucopus) is a larger mouse. The hind feet are longer. The tail is longer and is less sharply bicolored. Woodland deer mouse (Peromyscus maniculatus gracilis) is a larger mouse. The tail is much longer tail, up to 50% of the total length. The hind feet are longer. It is found mostly in woodlands. Seeds, fruits, nuts, acorns, green plant material, fungi, worms, snails, arthropods, and invertebrates. In autumn they collect and store food for use in winter. Females construct a round nest out of soft vegetable matter in a in a freshly dug burrow or in the discarded burrow of another animal. They begin breeding at about 49 days of age. They breed year round, though less frequently during fall and winter. They average 3 or 4 litters per year. Gestation takes from 22½ days in a non-lactating female to 30½ days in a lactating female. Five or six young are born naked with wrinkled skin. They are weaned after 25 to 35 days. Groups of 10 or more individuals spend the winter together in a nest to conserve heat. Adults are active year round during twilight and at night. They spend most of their time on the ground. 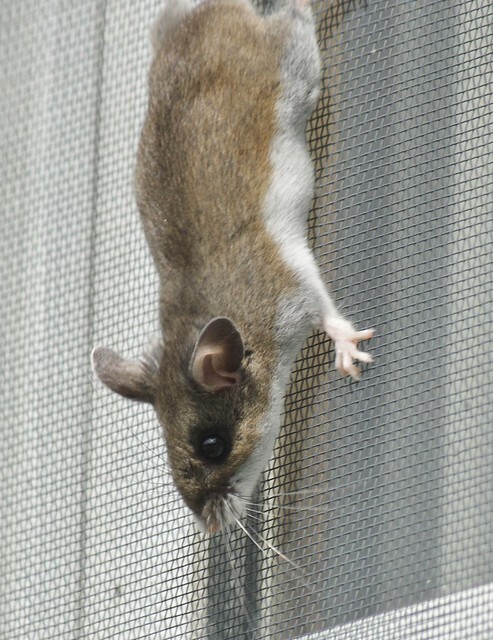 There are 67 currently recognized subspecies of Peromyscus maniculatus in North America, 2 of which occur in Minnesota. P. m. bairdii occurs in prairies and P. m. gracilis occurs on woodlands. The two subspecies ranges overlap and they are often found in the same area but in different habitats. In the Upper Great Lakes region there is little interbreeding. North American deer mouse (Peromyscus maniculatus) is probably the animal most responsible for the transfer of the deadly hantavirus to humans in the central and southwestern United States. The attached images are a young Deer Mouse I found hanging out inside a 5 gallon feed bucket. It just wasn't able to get out again. 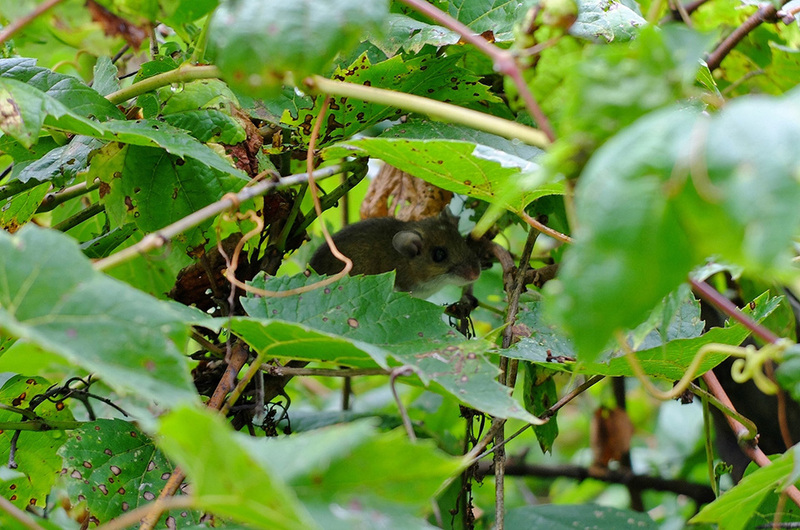 Because of the defined separation of colors I call this a Deer Mouse, Pennington Co, MN. I know they are a known carrier of HantaVirus, but I don't know of any case up here. I've been dealing with these guys for years now... knock on wood. 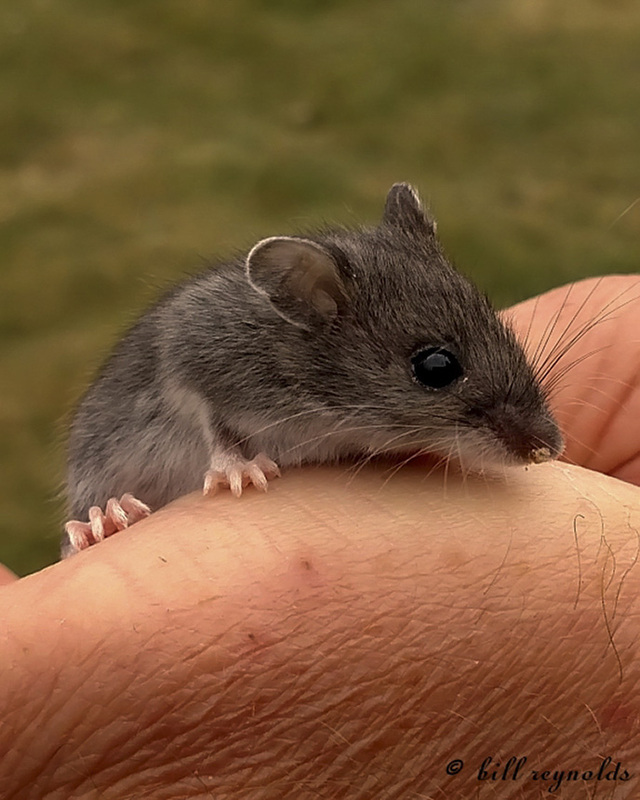 Meet the Deer Mouse; High Definition video of a North American Deer Mouse. Caught wild with a Kness Tip-Trap. 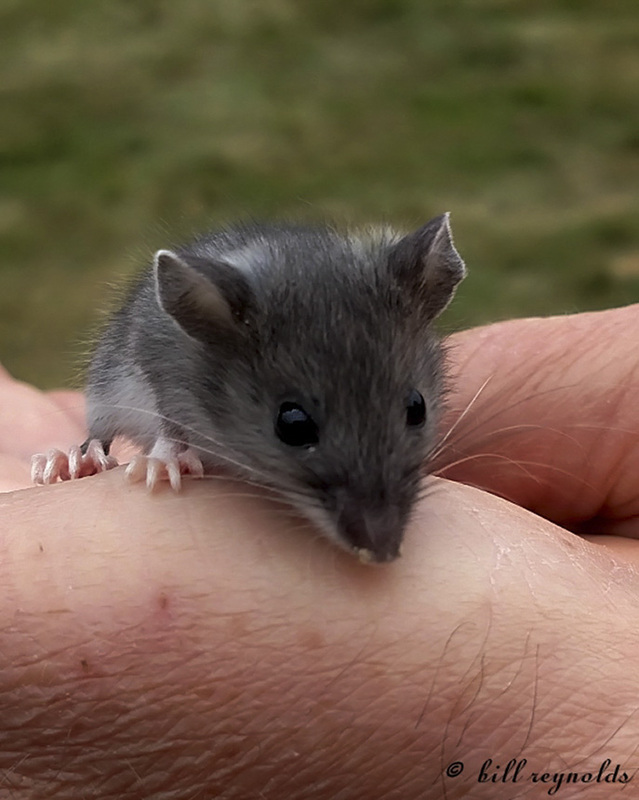 Wild Mice should never be kept as pets, they are often carriers of diseases which can be harmful to humans. Mice, Rats and Voles should be removed from chicken coops and other farm buildings. They should also be removed from homes. Photographed at the Glacial Ridge NWR, Minnesota (09 October 2010). The attached image are a young Deer Mouse I found hanging out inside a 5 gallon feed bucket. It just wasn't able to get out again.